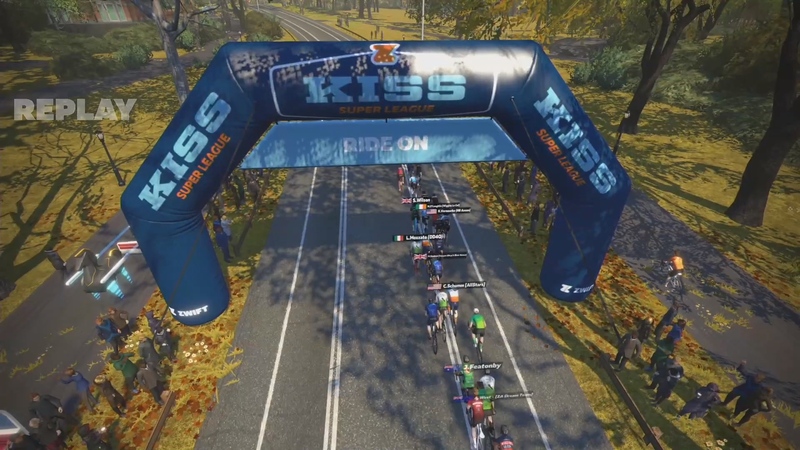 Stage Four of the Men’s KISS Super League was as quick as it was brutal. The race came down to an uphill sprint battle where the pros emerged victorious. Just 28 km long, today’s race covered three laps modeled on real roads in New York City’s Central Park. No major climbs, but the constantly rolling terrain keeps racers on their toes. Each lap ends on top of Cat’s Paw Hill, a short, 300-meter climb with an average 6% grade. Racers approach it from a slight descent. This means they can be carrying incredible speed into the sharp, uphill sprint finish. This was a race of attrition. Its short length and fast pace meant it was hard for riders to make big moves. Several riders attacked on the short kickers, including Kaden Groves (SEG Racing Academy) multiple times. They could not get away from the pack, but they could make every hill bite hard. Riders slowly dropped off the back as they were caught off-guard or just worn down. By the halfway point, there were about 30 riders left in the group. 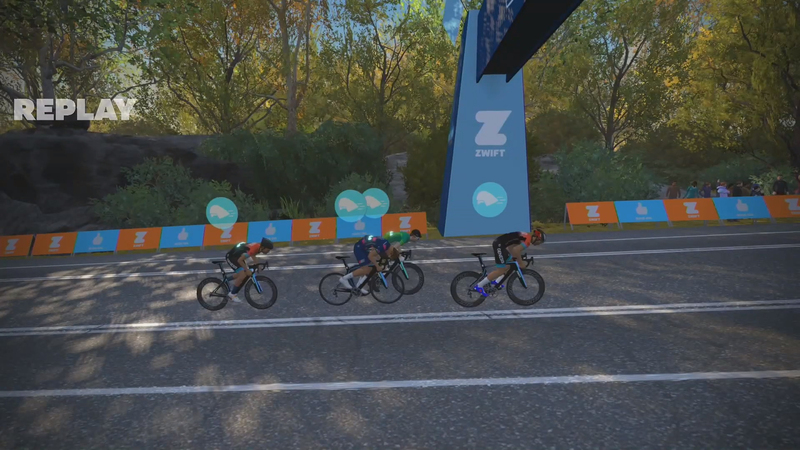 “It was all about keeping a good position in the pack so you don’t have to make efforts to bridge any little gaps,” said Lionel Vujasin (Zwift All Stars). Team Ribble was active in the intermediate sprint competition again, with Ed Hopper and Dan Bigham both picking up points. 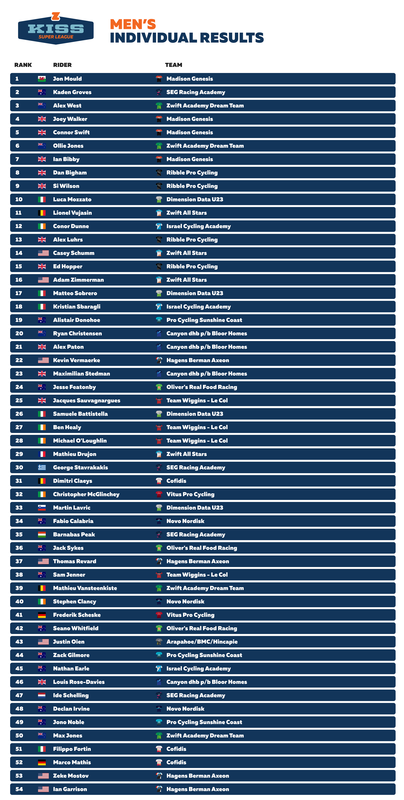 Connor Dunne (Israel Cycling Academy) also put up a good fight. But it was Lionel Vujasin (Zwift All Stars) who took the prize this time. He was first to cross the sprint banner on two of the three laps. 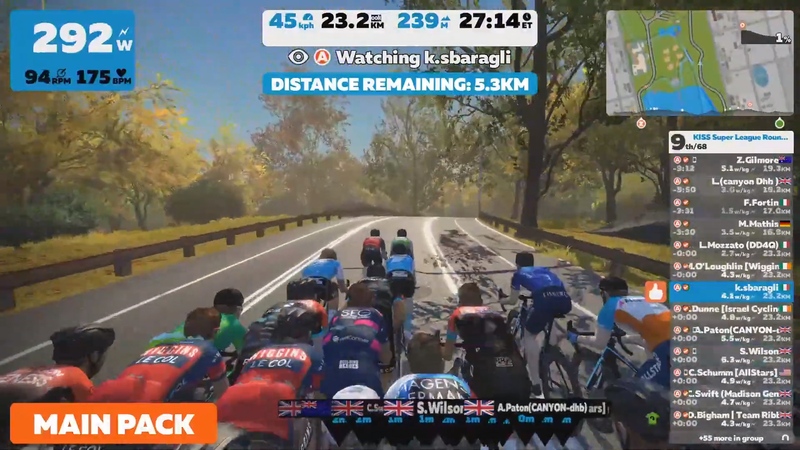 With 2 kilometers to go, Ed Hopper (Ribble Pro Cycling), Ian Bibby (Madison Genesis), and Ollie Jones (Zwift Academy Dream Team) tried to go for a long attack to the finish. But they could not snap the elastic that seemed to glue them to the group. The bunch hit the base of Cat’s Paw Hill at a blistering pace. 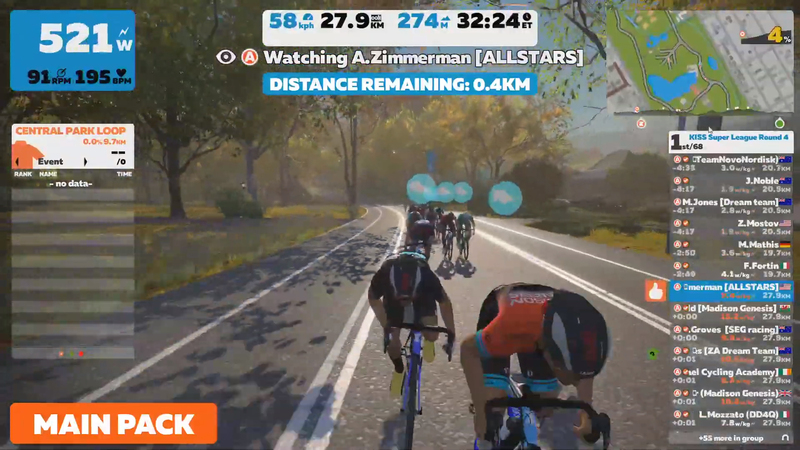 Adam Zimmerman (Zwift All Stars) shot out of the bunch with a big kick! But other racers came around as they wound up longer sprints, led by Jon Mould (Madison Genesis). Groves still had some energy for the finish and nearly came around to win it. Mould held him off to clinch his second victory in the KISS Super League. 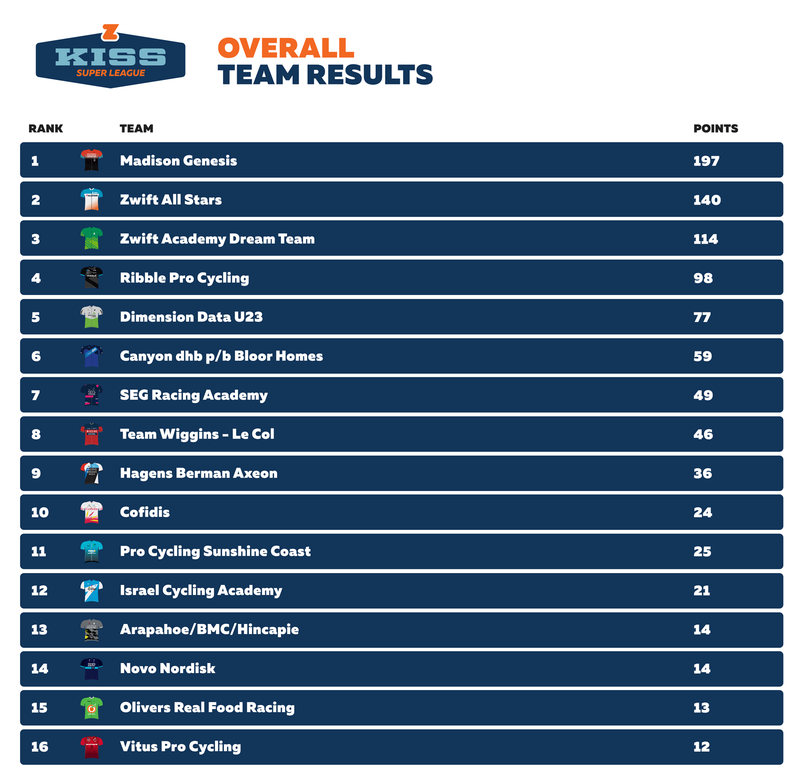 Madison Genesis managed to place four riders in the top 10 of Stage Four. They now have a solid lead over the other teams, but a lot can still happen in the last half of the series. He said the team focused on staying aware of what was happening in the race so that they didn’t miss anything. Once they got to the sprint, it just came down to who had the best legs. Vujasin said Madison Genesis is very organized, and “they know how to save energy and play their cards perfectly.” But he thinks the Zwift All Stars still have what it takes to unseat them. Other strong teams are learning and getting better, too. Next Wednesday, the men will ride the same Richmond, Virginia course where the UCI Road World Championships were held in 2015. Will it come down to a sprint finish, a breakaway, or a bold solo ride like Peter Sagan’s? But first – it’s the start of the women’s KISS Super League on Tuesday. Tune in live to catch both exciting races!